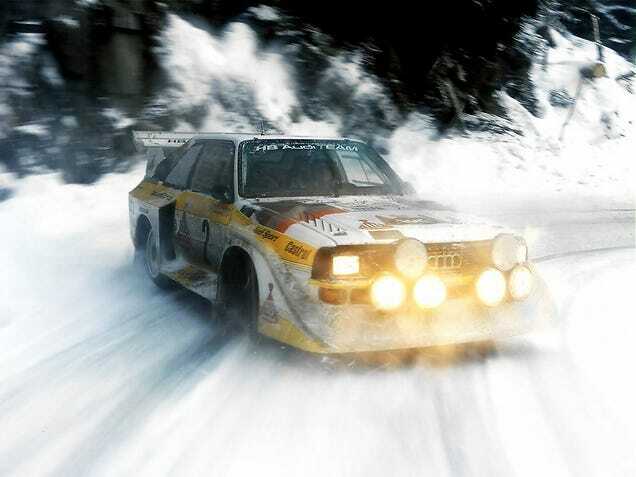 Group B Rally, also known as the era of the Killer Bs. In 1982 the FIA created a new rally class, Group B that contained almost no restrictions on engineering creativity or technology. The result was all wheel drive beast with no limits from Audi, Porsche, Ford, Lancia, Peugeot, Toyota, Citroen and Renault. The cars were ahead of their time using aluminum, magnesium, and Kevlar. The only thing that limited their speed was the driver and the road. Advanced aerodynamics, light weight materials and big horsepower created cars with speeds and performance that 30 years later have yet to be matched. The party came to an end in a cloud of death and debris. Three spectators were killed and 31 were injured when a Ford Rs200 plowed into the crowd. Later in that year Driver Henri Toivonen and Co-Driver Sergio Cresto were killed when their Lancia Delta s4 flew off the road and landed in a ravine. The car burst into flames and rescue workers took 30 minutes to arrive at the remote location. A Few hours after this incident, the FIA officially banned Group B starting from the 1987 season. Enjoy the sites and sounds of this amazing era. Mar 1 Close Up With the LaFerrari.